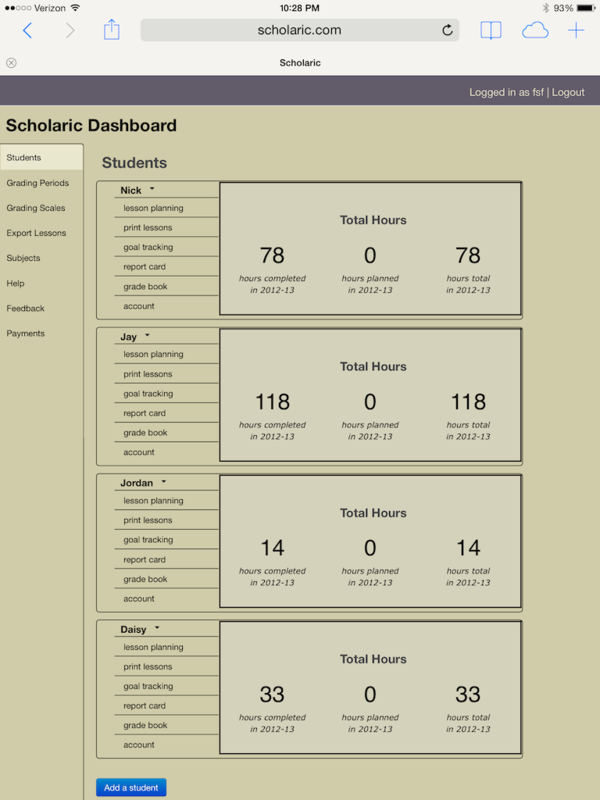 Official blog of Scholaric - the homeschool planner that SAVES you time. As announced earlier this year, the Scholaric price change started to impact existing grandfathered users in May, after a one-year grace period. Some of you have, when the time came, agreed to renew your subscription at the higher price, and I am grateful for it. These users were prompted to subscribe to the higher charge and agreed to it using Amazon Payments. This was supposed to do two things - (1) start to charge these users the higher amount on their next payment and (2) mark their account as being on a "new" plan. Unfortunately, due to a bug in the handling of the new payment plan, some of these accounts still show the "old" plan (see the above link for a screen shot of what this looks like) and are still being charged the old amount. Other than notifying these users, I am taking no action due to the bug. So in effect this bug is extending the duration on the "old" plan even longer for some users. Note this bug is now fixed, so future updates will work properly. When you do renew your payment authorization the next time, you may think, "Is Scholaric raising prices again?". It's not, just the same price increase. If you authorized a higher amount, and then get charged the lower amount, you may think "Will I be charged for both amounts?" You won't, Scholaric only allows one authorization per account. I hope this explains my error, and your gain. Sorry for the hassle. 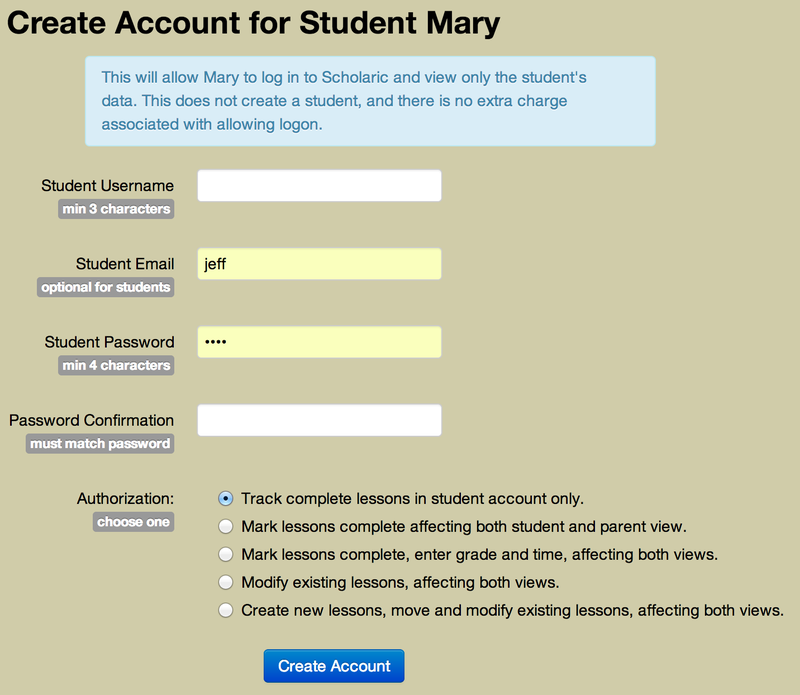 The account link takes you to the student account page, which allows you to control logon access to Scholaric for your student, set and change their password, and decide what they are able to do in Scholaric. The student account does NOT require an email address. If one is provided, the student can use it to reset their password. Otherwise, the parent will have to reset their password on the student account page. At the bottom of the account page, the parent must decide what authorization level to give the student. There are several levels to choose from, depending on what the parent wants the student to be able to do. 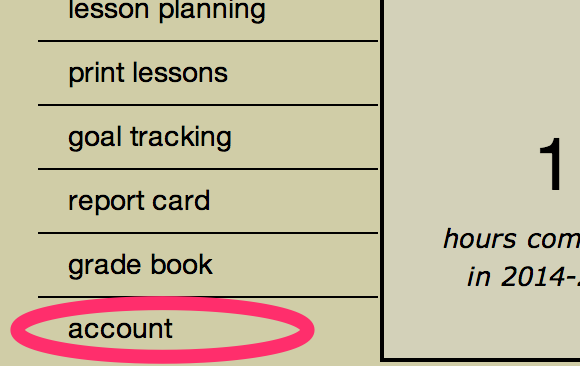 Track Work: At the most basic level, the student can track their work as completed, but it does not modify the complete state of the lesson in the parent's account. Lessons marked as "student complete" will show up as green. The additional color allows the parent to know the student's progress during the day. Mark Complete: Designed for students with a higher degree of trust, the mark complete level allows students to mark lessons as complete in both their account and the parent's account, but not to enter a grade. Note that these lessons will appear black, just as though the parent marked the lesson as complete. This level may be considered also for homeschools who do not track scores. Enter Grades: Designed for the student who grades their own work, this authorization level allows the student to enter scores as well. The parent will be able to view the scores and modify them. Edit Lessons: Designed for the student who works more independently, this level also allows students to modify the lesson text. Create, delete and move lessons: For those with complete trust, the student can be allowed even to create, delete, and modify lessons. Use with caution. Go to www.scholaric.com and log in, like you normally do on your device. It looks like a box with an arrow coming out of it. At the top on an iPad, bottom on a iPhone. This will put an icon somewhere on your home screen. Note, it may add it to a different screen than the one you are looking at. Optionally, move the icon around. This is useful to keep icons you use together. You can even create folders to keep related icons separated from others. To create a folder, drag one icon on top of another. You may need to rename the folder, as iOS only guesses a folder based on a common category of the two icons. Scholaric searches through the text lesson printouts and looks for URLs - uniform resource locators, in your lesson text and turns them into clickable HTML hyperlinks, or "hot" links. an abbreviated URL, beginning with www. Scholaric will insert a http:// before the url for you. Any plan that starts with Old like Old Standard is subject to the change. That time has come. May 1st it goes into effect, but only when you renew your payment. This is because you are protected from being charged a different amount than you agreed to under the subscription model I have chosen. 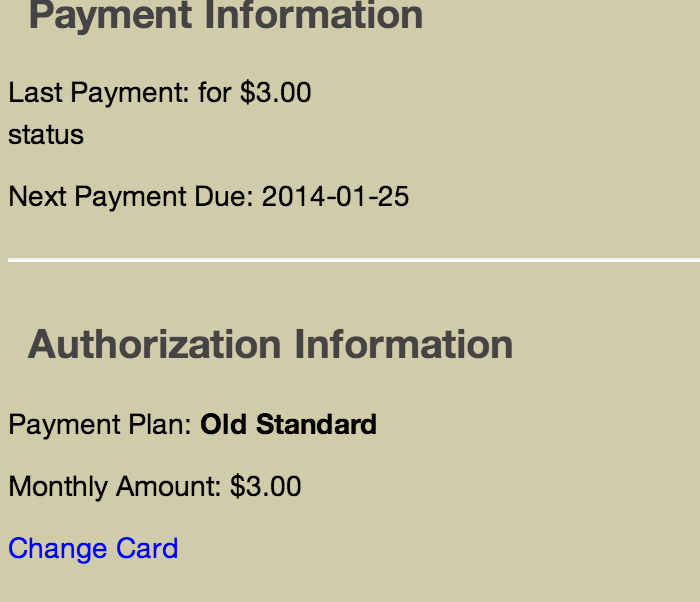 So the next time you add or remove a student, or have to change your card, payment renewal will be with the new amount. So, if you need to add or drop students, do it now, and reauthorize payment before May 1st! Unlike Grouping Sequences, where multiple lessons, or pages, or chapters, get grouped into a single lesson, you may want multiple individual lessons in a single day. This would be desired, for example, to assign several lessons in a single day, but have individual scores and times on each lesson. Grouping Sequences has a special syntax to allow the day's group to have individual lessons. will produce two individual lessons per day. Note the second asterisk. produces one lesson covering two per day. 1. Drag the lesson to a new date and drop it. Note this does not work on mobile devices. 2. 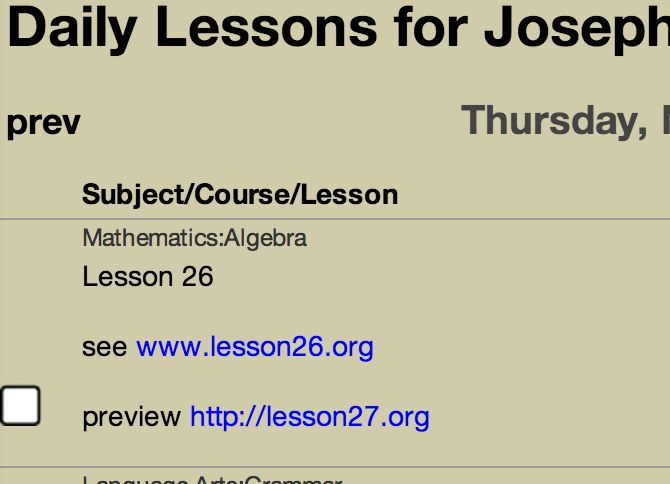 Edit the lesson and click on the lesson's date. Then select a new date and hit update. This is useful to change the lesson to another week, or for any change on a mobile device. 3. 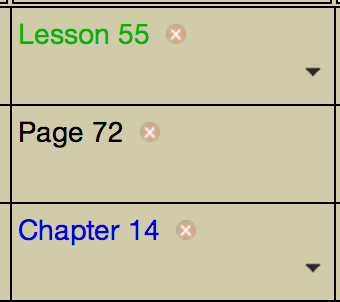 Bump the incomplete lesson earlier or later using the cell menu. Note - this impacts other lessons. To move the entire incomplete schedule, we must bump from the end of the period. Select the menu option bump schedule earlier from end of period. This is the equivalent of navigating to the last planned date for the selected course and student, and bumping earlier. To open up a gap at any point in the schedule, navigate to the date to become empty, and select the menu option bump schedule earlier from this date. This will push the incomplete schedule backward from the selected date only. Note that in either case, the bumping behaves according to the bumping criteria. If your bump does not carry forward as far as you expect, your lesson schedules likely do not match. To bump lessons, a cell must have at least one incomplete lesson. Bumping is performed according to the schedule of the lesson, which visible on the schedule tab when updating. The schedule is set by the repetition schedule when a lesson series is created, or defaults to the course default schedule. When bumping, scholaric targets the next available date, or previous available date, of the lesson depending on the bump action (earlier or later). The date will naturally skip holidays and vacation days, but not event days. Note that when bumping a cell with multiple incomplete lessons, they could have different schedules, resulting in different target dates. The date of the lesson is updated and then the process is repeated within the target date, if the target date has incomplete lessons, and only for those incomplete lessons that have the same schedule as the original lesson. In this way, Scholaric won't continue the bump chain, for example, a MWF lesson scheduled on Wednesday, when the previous lesson was a MTWTF lesson, scheduled on Tuesday. Scholaric remembers your selection and uses it the next time you print out. 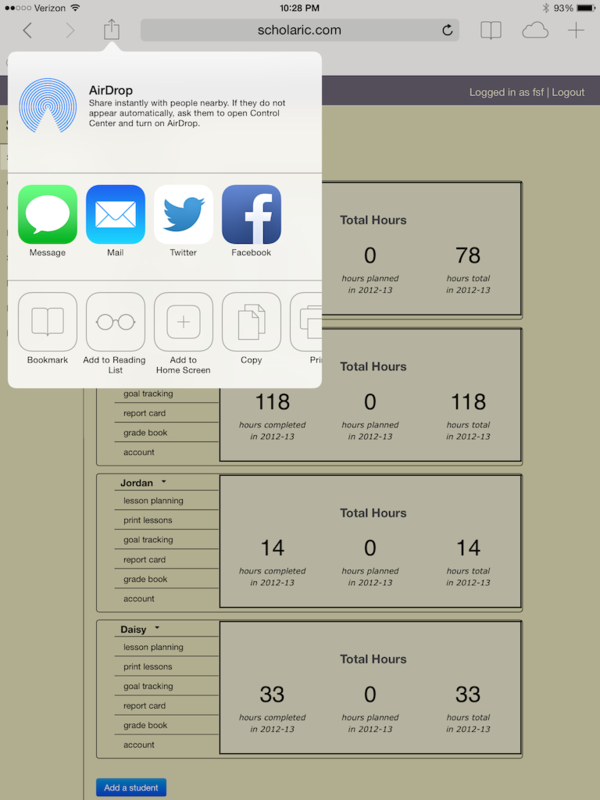 It's the effortless way to plan and track your homeschool. Get started for free today at www.scholaric.com.